...imagining Europe? Not a chance! You're about to discover Napa Valley, California! Nestled between mountain ranges, the heart of Wine Country is blessed with a rich blend of fertile soil, warm sunshine and cool, misty bay breezes, rivaling the best grape-growing regions anywhere. California's agricultural gold mine also happens to offer an abundance of awe-inspiring views, luxurious lodgings, pampering spas and sumptuous dining, making every day a celebration. Whether you've dreamed about going -- or you already know this beautiful wine region -- you can experience all its wonders right here. Discover the vast array of Napa Valley wines, grape by grape. And find out what makes Wine Country the undisputed premiere wine region in America. Explore unspoiled towns bursting with personality, charm and friendly small-town spirit. Get to know the attractions, festivals and events. Plus, favorite shops, eateries and places to stay. 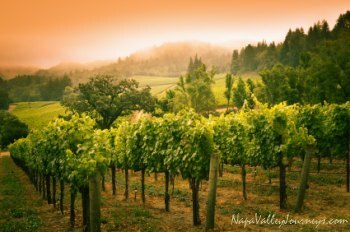 Drink in the spectacular scenery of Napa -- pine-covered mountains swallowing sunsets, rolling hills blanketed with grapevine rows, misty morning skies -- so much to delight you. This is America's most famous wine region. Stretching a mere 30 miles long, the valley boasts more than 400 wineries, some over a century old. New boutique wine producers are popping up in this busy region, too, and for good reason. The sunny, temperate climate shines through in the lavish complexity of the wines, making Napa Valley the home of world-class cabernets and merlots. The cooler, southern tip of Napa provides the ideal spot for chardonnays and pinot noirs. Of course, there's more...but we'll get to those later. I imagine you're wondering who's behind this site. I'm not a sommelier -- or a travel agent -- just someone with an appreciation for good wine, scrumptious food, and the breathtaking scenery to savor it all. My passion for this spectacular wine region has led me on winery tours and tastings. I've learned a great deal about California wines, and discovered my favorite places to visit. 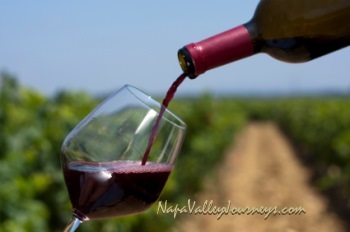 I'd like to help you explore Napa Valley in hopes you'll enjoy it as much as I do. You don't have to look far to find a good place to eat. Discover the best Napa Valley restaurants. Soar above the valley with a Hot Air Balloon ride and take in panoramic views. Before you head out to tour Napa Valley wineries, take a look at your options. Napa Valley bicycle tours are a perfect way to explore the wineries and towns, while taking in the postcard scenery. 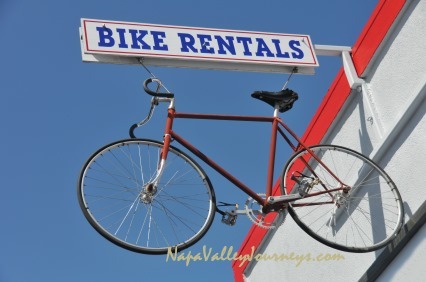 Discover options for your Napa Valley bike tour here. 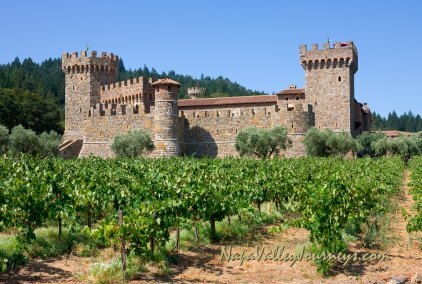 The Castello di Amorosa is a treat for all your senses. Take the fascinating tour and enjoy a wine tasting in the magnificent Grand Barrel Room. 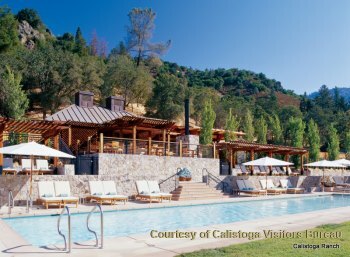 Napa Valley resorts cater to those who want a truly carefree getaway. Whether you want to unwind in a spa oasis or golf, do cardio or play tennis, you'll want to explore the resorts in Napa Valley. Copyright © 2012 - 2019 NapaValleyJourneys.com All rights reserved.